It’s a story as old as time: hacker sees cool tool, hacker recoils in horror at the price of said tool, hacker builds their own version for a fraction of the price. It’s the kind of story that we love here at Hackaday, and has been the impetus for countless projects we’ve covered. One could probably argue that, if hackers had more disposable income, we’d have a much harder time finding content to deliver to our beloved readers. [ Alex Jensen] writes in to tell us of his own tale of sticker shock induced hacking, where he builds his own version of the Hak5 Bash Bunny. His version might be lacking a bit in the visual flair department, but despite coming in at a fraction of the cost, it does manage to pack in an impressive array of features. This pentesting multitool can act as a USB keyboard, a mass storage device, and even an RNDIS Ethernet adapter. All in an effort to fool the computer you plug it into to let you do something you shouldn’t. Like its commercial inspiration, it features an easy to use scripting system to allow new attacks to be crafted on the fly with nothing more than a text editor. A rudimentary user interface is provided by four DIP switches and light up tactile buttons. These allow you to select which attacks run without needing to hook the device up to a computer first, and the LED lights can give you status information on what the device is doing. [Alex] utilized some code from existing projects, namely PiBunny and rspiducky, but much of the functionality is of his own design. Detailed instructions are provided on how you can build your own version of this handy hacker gadget without breaking the bank. Given how small and cheap it is, the Raspberry Pi is gaining traction in the world of covert DIY penetration testing tools. While it might not be terribly powerful, there’s something to be said for a device that’s cheap enough that you don’t mind leaving it at the scene if you’ve got to pull on your balaclava and make a break for it. Over the last few years one thing has become abundantly clear: hackers love cramming the Raspberry Pi into stuff. From classic game systems to mirrors, there’s few places that haven’t been invaded by everyone’s favorite Linux SBC. From the inspired to the bizarre, we’ve brought such projects to your attention with minimal editorialization. As we’ve said before: it’s not the job of Hackaday to ask why, we’re here to examine how. That said, some builds do stand out from the crowd. 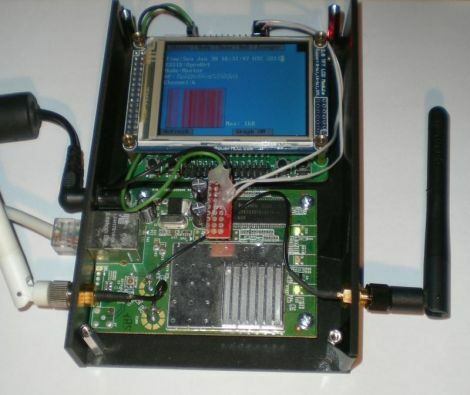 One such project is the “Pentesting BBU Dropbox” which [b1tbang3r] has recently posted to Hackaday.io. 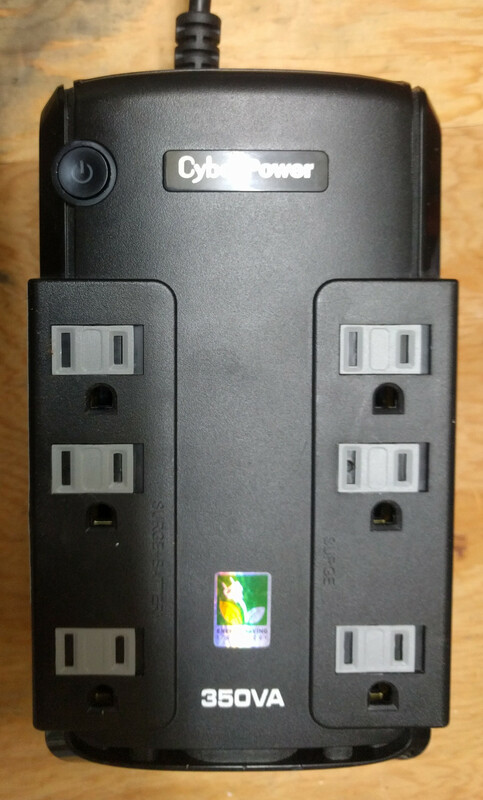 Noticing the battery bay in a cheap Cyberpower 350VA battery backup was just about the same size as the Raspberry Pi, he decided to convert it into a covert penetration testing device. Of course the illusion isn’t perfect as the battery backup function itself doesn’t work anymore. But if you hid this thing in an office or server room, there’s very little chance anyone would ever suspect it didn’t belong. The key to the final device’s plausibility is that from stock it had dual RJ-11 jacks for analog modem surge protection. Swapping those jacks out for RJ-45 network connectors gives the BBU Dropbox an excuse to be plugged into the network. At a cursory glance, at least. Internally there is a TRENDnet Ethernet switch which allows the Pi to get on the network when an Ethernet cable is plugged into the battery backup. We especially like the little details [b1tbang3r] put in to make the final device look as real as possible. The “Reset” button and “Wiring Fault” LED have been connected to the GPIO pins of the Pi, allowing for an exceptionally discrete user interface. For instance the LED could be setup to blink when a scan is complete, or the button could be used to wipe the device in an emergency. This build reminds us of the Power Pwn released back in 2012 by Pwnie Express. That device was based around a relatively bulky power strip, and the only “feature” it looks like this DIY build is missing from the professional version is the $1,300 price. A pentesting dropbox is used to allow a pentester to remotely access and audit a network. The device is dropped onto a network, and then sets up a connection which allows remote access. As a final project, [Kalen] built the Rogue Pi, a pentesting dropbox based on the Raspberry Pi. The Rogue Pi has a few features that make it helpful for pentesting. First off, it has a power on test that verifies that the installation onto the target network was successful. Since the install of a dropbox needs to be inconspicuous, this helps with getting the device setup without being detected. A LCD allows the user to see if the installation was successful without an additional computer or external display. Once powered on, the device creates a reverse SSH tunnel, which provides remote access to the device. Using a reverse tunnel allows the device to get around the network’s firewall. 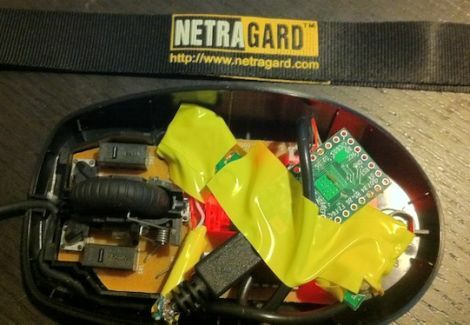 Aircrack-ng has been included on the device to allow for wireless attacks, and a hidden SSID allows for wireless access if the wired network has issues. There is a long list of pentesting tools that have been built to run on the Pi. Check out a video demonstration of the dropbox after the break. Over the last few months, we’ve seen our fair share of pentesting appliances. Whether they’re in the form of a Raspberry Pi with a custom distro, or an innocuous looking Internet-connected wall wart, they’re all great tools for investigating potential security vulnerabilites at home, in the workplace, or in someone else’s workplace. Pwnie Express, manufacturers of pentesting equipment, are now releasing one of the best looking and potentially most useful piece of pentesting equipment we’ve ever seen. It’s called the PwnPad, and it allows you to get your pentesting on while still looking stylish. Based on Google’s Nexus 7 tablet, the PwnPad combines all the goodies of a really great tablet – the ability to read NFC tags and multiband radios – with open source tools and a USB OTG cable with USB Ethernet, Bluetooth, and WiFi adapters. Everything in the PwnPad is designed for maximum utility for pentesting applications. Of course, for those of us that already have a $200 Nexus 7, Pwnie Express says they’ll be giving away the source for their software, enabling anyone with knowledge of make to have the same functionality of the PwnPad. Of course you’ll need to get yourself a USB OTG cable and the WiFi, Bluetooth, and Ethernet adapters, but that should only add up to about $100; combined with a $200 Nexus 7, building your own is more than just a bit cheaper than Pwnie Express’ asking pre-order price of $795. While some people know that you should be wary of USB drives with unknown origins, the same care is rarely, if ever exercised with USB peripherals. The security firm Netragard recently used this to their advantage when performing a penetration test at a client’s facility. When the client ruled out the use of many common attack vectors including social networks, telephones, social engineering, and unauthorized physical access from the test, the team at Netragard knew they would have to get creative. They purchased a Logitech USB mouse and disassembled it in order to add their clever payload. A Teensy uC was programmed to emulate keyboard input, entering commands via the mouse’s USB connection once it had been connected to a computer. Using an undocumented exploit in McAfee’s antivirus suite, they were able to evade detection while their system entered commands to install malware from the flash drive they hid along side the Teensy. Once the mouse was reassembled, they repackaged it along with some marketing materials to make it look like part of a promotional event. They purchased a detailed list of employees and singled out an easy target, sending their malicious mouse on its way. Within three days, their malware was loaded onto the victim’s computer and their test was deemed a success. Hackaday forum member [Emeryth] recently posted his newest creation, the Wifon 2.0, which is an update to a project we featured last year. The second iteration of the device looks to make several improvements on the already solid concept. Ditching the simple 16×4 LCD, version 2 sports a full color 320×240 touch panel LCD. A faster STM32 micro controller replaces the Atmega88 he used the first time around, allowing him to create a much more advanced user interface. The micro runs the ChibiOS/RT real time operating system, which enables multitasking, making the entire project a lot easier. Like the first version, an original Fonera performs all of the pen testing, though this time around he has ditched the vanilla DD-WRT distro for Jasager, which is purpose-built for running the Karma attack. The project is coming along nicely, and [Emeryth] says he has a few simple apps running on the device already. He has found that running several applications on the device simultaneously is testing the practical limits of the Foneras capabilities, though he may add more memory to the router in order to squeeze a little more life out of it.